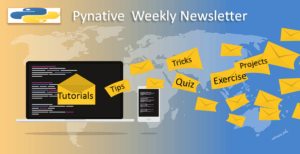 Pynative Newsletter to get Python Tutorials, Tips, Tricks, and Exercises. Receive Weekly Python Tutorials, Tips, Tricks, and Exercises. I have started this newsletter to make a connection with the Python developers who read my articles. Feel free to reply to any of our emails! I’ll do my best to get back to you. Also, I’d love to hear your suggestions and feedback. The newsletter is free, and you can unsubscribe any time. Join our newsletter to Get New Tutorials, Tips, Tricks, and Exercises into your inbox every week. Signup today and receive New Python Articles, Exercises, Tips and Tricks straight in your inbox Every WEEK! We take your privacy seriously. No spam Ever!. Unsubscribe any time! Email Frequency? Usually, We send out a newsletter email once or twice a week. Also some of the time when we add new tips and trick on our Tips and Trick page. What if I want to unsubscribe? No problem, You can unsubscribe any time. Our every mail contains the link to unsubscribe. You can click the unsubscribe link, and you will not get any further updates from us.